On Monday, July 16, 2012 the Department released an ENS stating that effective October 1, 2012 the Class D uniform will no longer be authorized. Like many of you in the department, PLEA had heard rumblings that the new Chief might want to do away with the Class D uniform. In prior meetings with Chief Garcia, he led us to believe that uniform issues were very low on his list of priorities. PLEA was not consulted or asked to participate in any meetings related to uniform changes. This morning, PLEA Board Members Ken Crane and Jerry Gannon met with Chief Garcia to discuss unrelated issues and were told by the Chief that an ENS would be released later today and that effective October 1st, the Class D would no longer be allowed. Jerry and Ken made several arguments in favor of keeping the Class D and suggested that at a minimum the Class D should be given a 1 year wear-out period, as is the the norm with other uniform items the department has phased out in the past. While the Chief listened, it quickly became apparent that PLEA’s comments would not sway a decision that had already been made. To say that PLEA is shocked and dissapointed in the department’s lack of willingness to partner cooperatively in a solution to this issue is an understatement. Still more disheartening is the straw-man arguments combined with 4 year old photographs from the home invasion shootout on West Cypress St. that were put forth as reasons for dis-allowing the Class D uniform. PLEA worked long and hard in a cooperative effort with management nearly 15 years ago to obtain a workable uniform that would provide comfort, be functional from a utilitarian standpoint, while at the same time, providing a professional appearance. A move such as this strikes yet another blow to the already damaged morale of the police department’s patrol force. PLEA was inundated with phone calls shortly after the release of the ENS expressing concerns from members with medical issues and expenditure of funds for recently purchased Class D uniforms and related items. If you fall into one of these two categories call the PLEA office for guidance. There are several questions that remain unanswered as a result of this impending policy change. PLEA will continue to pursue this matter with the Department and City and will keep you updated. 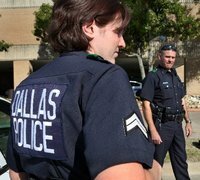 CLICK HERE to see how Dallas PD does it.